Are you blown away by the cost of using Crestron™, AMX®, or other media servers to control the TVs in your Bar or Restaurant? The Mediatune COM2000 video management system allows you to control all your TVs from a single iPAd for a fraction of the cost and 1/3 the space of similarly featured video management system from Crestron, AMX, or other video control systems. Mediatune™ is a next generation, revolutionary video management system based on the COM2000 satellite headend solution designed to specifically serve the Bar and Restaurant commercial market. The Mediatune system enables easy control of multiple TV sets using a browser based application running on your PC, laptop or tablet instead of multiple remote controls. With the Mediatune system and the COM2000 headend, you simply drag and drop your selection of programs onto the right TV icons to manage your TV sets without having to make any changes to your matrix system installation. Up to 70 unique video outputs with unlimited DIRECTV™, ASTC, or external content inputs. Original broadcast quality content delivered over QAM distribution. No signal transcoding, encoding or other signal manipulation which can degrade quality. Pro:Idiom™ protected video to ensure copy protection is maintained all the way to television display. Simple to install, easy to manage, less than half the size and cost of a traditional switched matrix video system using stacked receivers. 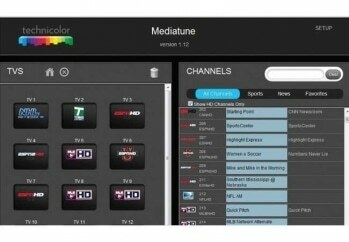 Mediatune presents a fundamental shift in how you might typically think about controlling a video distribution system. Old School RF distribution systems provide a fixed channel line-up allowing each TV to tune through channels. In the revolutionary Mediatune configuration, each TV is set to a fixed QAM channel and the source is switched. The control interface then allows you to search through the entire DIRECTV™ channel package to select the desired programming, and then place that programming on the desired TV to watch. You can watch the same content on all the TVs, or depending on how many tuners are in the system, each TV can have its own tuner allowing each TV to watch a different source channel.